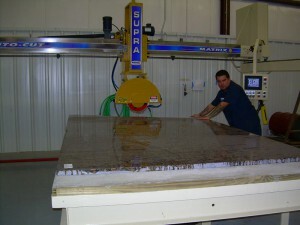 We have over 22 years of experience fabricating and installing many different types of countertops. If you are a builder, kitchen and bath dealer, remodeler, or general contractor in the Mooresville, North Carolina area, we encourage you to let us meet your countertop fabrication and installation needs. At , we have over 22 years of experience working with many different types of countertop materials and are committed to your complete satisfaction. The different types of countertops we fabricate and install include granite, marble, quartzite, onyx, soapstone, limestone, travertine, slate, and quartz from Cambria, Ceasarstone, Silestone, Zodiac, Hanstone, LG Viaterra, Wilsonart, Vetrazzo and Geos Recycled Glass, and other engineered materials. Thanks to our extensive selection of options, we are confident that you will find exactly what you are looking for as you embark on an impending project. Although our selection is commendable, one of the main things that ensures the quality of our services is the state-of-the-art technology we use at our 15,000-square-foot fabrication facility. For example, we are able to precisely cut natural stone and other engineered countertop materials because we use a five axis CNC saw and routing technology from GMM and Intermac, as well as water jet technology by Flow International. We also use an RCM inline detail machine when we profile and polish edges. Additionally, we have skilled craftsmen that miter, laminate and make full custom edges by hand. This is where old and new technology meet. We encourage you to leave your countertop fabrication and installation needs to our team because we charge competitive prices, make sure projects are completed and delivered on time, and guarantee all of our work. Please reach out to us at today to receive further information about our services or to find out more about our capabilities. As your countertop partner, we will do everything we can to exceed your expectations.